Once the message has been developed, it is up to the leader to disseminate it through words and actions. The ultimate test of the leadership points is the ability to deliver the leadership message with frequency, constancy, and conviction. The chapters in Part II will help you amplify your message from concept to delivery and follow-through, chiefly by connecting with an individual or group through oral communications. The ability to stand and deliver either one-on-one or one-to-one thousand is the ultimate test of a leadership communicator. When communications is done correctly, people will be inspired to follow, and in the process will achieve inspired results for themselves, for the leader, and for the organization. To me, a ballpark filled with people is a beautiful thing. It's an epitome, a work of art. I guess I have seen everything in the country: Yosemite, Old Faithful, the Grand Canyon, and the most beautiful thing is a ballpark filled with people. Ballparks should be happy places. Pat Williams with Michael Weinreb, Marketing Your Dreams: Business and Life Lessons from Bill Veeck, Baseball's Marketing Genius. The executive had worked very hard on his presentation. He had been invited to be a guest speaker and receive an award for his services to the industry. It was a prestigious event. So, as befit the occasion, the executive had collected his information; he had even hired a speechwriter to script the speech and a graphic services company to produce the visuals. He arrived early in the day to assess the room and even rehearsed on site. At the appointed hour, the executive was introduced, and he proudly took the podium. Looking out over the audience, he took a deep breath, smiled, and began his presentation. He was careful to note how proud he was to receive the award. Everything proceeded well - for about 30 seconds. Then the audience began to grow restless, and after another minute or so it began a series of catcalls: "Come on. Hurry up. We're getting thirr - sty!" After another minute, individuals in the audience began to throw things. Bound and determined to be heard, the executive, like a St. Bernard in a snowstorm, plowed ahead. As the crowd grew more restless, he began to speak louder. When things hit the stage, he grew louder still, until after 3 minutes or so, he was shouting into the microphone. What went wrong? How could something that started so wonderfully and was prepared and rehearsed so carefully go so terribly wrong? Simple. The executive had failed to assess his audience. Not until later, when the speech was over and he had retreated to the safety of an anteroom, did the executive learn that he had been the only thing standing between the audience and the bar. It was the end of a long day, and the crowd of salespeople and industry representatives was in no mood for more talk. They wanted to "drown the day" with libations. Every presenter has an obligation to meet the audience's expectations. In this regard, you are like a singer or a musician who is hired to perform. The audience may not be paying you in currency, but it is paying you with something more valuable - its time. And finally, audiences expect messages that are in tune with their wants and needs. Salespeople need to meet this expectation exactly. Others, however, can deviate somewhat. Often the presenter must deliver a tough message about hard issues, e.g., a corrective measure, a quest for improvement, or the big one - the need for change. Messages like this make us feel uncomfortable, so it is up to the presenter to find a way to make the message amenable without changing its content. A sure way to do this is to appeal, as Washington did, to a shared past and an attitude that "we are all in this together." Facing a tough audience is not easy. But let's face it, sometimes it must be done. Management must talk to unions. Politicians must face voters. School boards must face parents. And so on. Not everyone wants to hear everything that you as a presenter have to say. Anticipating objections is part of the presentation process. If you follow the Toulmin argument process, you can formulate your rebuttals using the claim-reason-warrant methodology (see Chapter 6). With that in mind, here are some tips you can use to prepare yourself for those tough situations (see Figure 7-1). Determine the objection. Isolate the "hot potatoes." Before you stand in front of the audience, find out possible issues or concerns the audience may have with you or the organization you represent. Vince Lombardi was a hard-nosed coach. He knew that players would initially resist the kind of discipline and hard work he would impose, but this did not stop him from getting his message across. He would deflect objections through implication: If the individual players did not adhere to the regimen, they would be gone. If you are a salesperson, you need to know the account history before you try to sell. For example, if the salesperson before you was a jerk, your audience may harbor negative views about you. You need to know this before you walk into the room. Likewise, if you are an executive addressing a group of frontline employees, you need to know their concerns about their work, the management team, and possibly yourself. Acknowledge the issue. Say the issue out loud. If it is poor product quality or a tough question regarding management, spell it out - e.g., "I know you have an issue about this." As a former prosecutor, Giuliani was accustomed to dealing with objections. As mayor, he would freely give voice to the opposition as a means of acknowledging dissent. In doing so, Giuliani demonstrated that he was informed on and involved with the issues, even if he did not change his mind. Empathize. When issues on are the table, communicate your concern. This does not mean that you say whatever the audience may want to hear, it means that you demonstrate concern - e.g., "I understand the issues you are facing." With guests on her show, Oprah oozes sympathy in a way that gets the guest to open up and share a personal moment that will enable the audience to understand an issue more vividly and sometimes viscerally. Remind the audience of shared experiences. If you or your organization has a prior relationship with the audience, mention it. If it is a good relationship, say so. If it is one that soured, say so. The audience expects you to be honest. At Newburgh, Washington established the shared experiences at the outset. Katherine Graham made the Washington Post her life; her communications emerged from that commitment. Everyone who was part of the company understood that she stood for journalistic excellence and that by embracing that premise they could share in the enterprise. Deliver the message. Once you have laid the groundwork for your presentation through acknowledgement and empathy, you are ready to move into your message and deliver your content. You are free, however, to emphasize or deemphasize according to audience expectations; in this way, you remain responsive to audience needs. Actor-director Robert Redford is accustomed to fighting battles over causes he believes in. His public speeches, together with his professional commitments, give him a platform upon which to stand tall on an issue, even when he knows that people can and will disagree with him. Open the door for compromise. 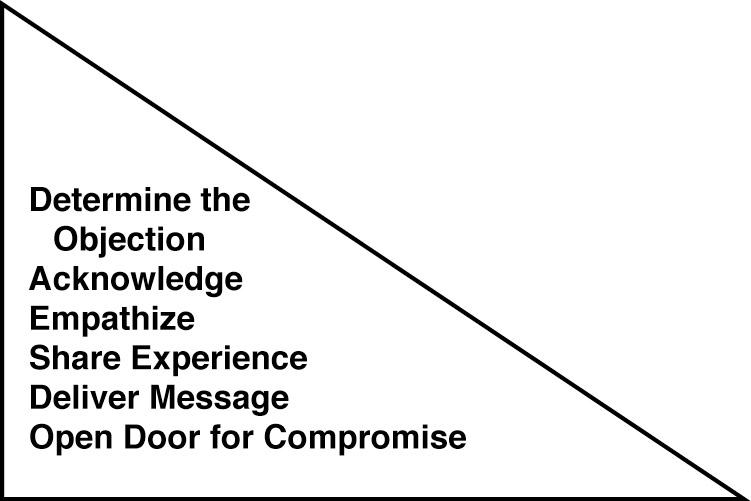 If the issue you must defuse is potentially divisive, you may wish to create a forum for compromise. Your presentation then becomes the first step in the healing process. You are entitled to present your views, but if you expect to create an action step - e.g., a sale or a dialogue - you need to open the door for action, that is, what's next? As a manager of 25 highly talented baseball players, Joe Torre lives by the art of compromise. He uses his communications to smooth over disagreements and open the door for cooperation. If you get beyond the objection, you can talk about how you would like to be part of the solution. You would like to help bury the hatchet and work out the issues together. The good news is that when you can overcome objections within your presentation, very often you will win the audience over to your side and it will be receptive to your message now and in the future. If you get beyond the objection, you generate an opportunity for a relationship. The relationship may last only as long as the presentation, or it may last far longer. Relationships emerge from a community of understanding and a sense of trust. To use a gardening analogy, relationships do not bloom overnight, but they can emerge over time if the ground is made fertile and adequately watered. Oprah has taken the relationship with an audience to an all-time level; over the decades she has been on the air, she has forged a bond with her audience, which has come to understand her as someone who reflects its issues and seeks to make the world better for it. Both the success of your leadership presentation and your personal credibility depend upon assessing audience expectations. You can establish a relationship only if you demonstrate that you understand and acknowledge audience issues. Audiences have expectations. It is up to the presenter to determine those expectations prior to the presentation or upon its delivery. Understanding audience expectations can make the difference between a forgettable nonevent and a memorable event. Identify a key information resource. Create a five-question survey. Mail it to key informants. Collate the data. Ask what is on people's minds - e.g., "What issues related to what I will say should I be aware of?" Make a list of relevant issues. Find ways to link those concerns to your content early in your presentation. What story or analogy might you use to connect what you do and the issue facing the audience to whom you are speaking? When you look at Major League Baseball today, you would be hard pressed to find another business whose practices are so diametrically opposed to the needs of its customers - the fans. As owners and players regularly accuse one another of escalating levels of greed, it is the fan - the one who pays the escalating ticket prices - who gets left out in the rain like the family dog as the two sides bicker among themselves. In moments of despair for the National Pastime, it is useful, and hopeful, to recall that while owners and players have always been adversaries, there was one man in the game who marched to a different drummer - his own! He was Bill Veeck, and the cadence he marched to, wooden leg and all, was the same as the fans'. He loved the game as much as they did because first and foremost he was a fan himself. He was also passionate, opinionated, fun-loving, and dedicated to the value proposition "If you don't think a promotion is fun, don't do it!" And for an owner and baseball executive who had teams that finished first as well as last, no one ever had more fun than Bill Veeck. He was one part P. T. Barnum and one part Sam Walton - a combination of showmanship and customer value. Along the way, he irritated the plutocrats running the game and delighted the crowds who filled the stadiums. In his own unique way, Veeck was a leadership communicator who lived and breathed a message of honesty, integrity, and entertainment. In a game going back nearly a century and a half as a professional enterprise and noted for its characters, Bill Veeck was unique. When he was 3 years old, his father became general manager of the Chicago Cubs. Veeck grew up in the game; in fact, he planted the ivy that adorns the brick walls of Wrigley Field. Later, as a junior executive in the organization, he ordered a new scoreboard, and when it wasn't finished on time, he hired a crew - and rolled up his sleeves - and assembled it in time for opening day. True to his character, Veeck paid the inventor in full even though he had not completed the scoreboard on time. But Veeck also was a businessman. When the inventor wanted to bid on the exploding scoreboard for the Chicago White Sox many years later, Veeck said no. Veeck was not one to exploit the misfortunes of others. As one writer put it in the introduction to the re-release of Veeck's autobiography, Veeck - As in Wreck, now back in print 40 years after its first printing in 1962, "Physically, of course, Bill was not all there. His body was a mosaic of broken parts on borrowed time." He wore a prosthetic leg, the legacy of a war wound suffered as a Marine in the South Pacific in World War II. The leg, along with his "impish smile," became his trademark. Veeck's promotions revolved around a desire to tickle the imagination. "You give away a radio or a TV - so what? What does that do for the imagination? Nothing. . . . If I give him 50,000 nuts or bolts, that gives everybody something to talk about." And Veeck knew that when people are talking about your product, they will be more inclined to pay money to come out and see it. Veeck's promotions sprang from his values; he was a "giver." He wanted to entertain his customers, and he wanted them to have something extra in return for their patronage. Veeck's final bit of advice on promotion was, "No one has a monopoly on ideas. You can always think of something." Give back something. Leaders need to show their appreciation for their stakeholders. Veeck gave the fans something of himself - a sense of surprise, showmanship, and fun. Bill Veeck with Ed Linn, Veeck - As in Wreck: The Autobiography of Bill Veeck; reprint, with a foreword by Bob Verdi.